What a week! What a rewarding, enriching, and fun-filled week! Foxfire has been alive with so much activity, I can hardly focus my memory to catch it all. This marked the first week of Summer Leadership with four very talented and ambitious Foxfire students – the leaders for the upcoming year. Jesse Barlow, Susanna Grafton, Carlie Owns, and Reagan Turner showed up on Monday raring to go; and go, they have. It’s been a productive week. Kaye Carver Collins (Foxfire alum, educator, and book editor), has led most of the week’s activities, which included polishing up the students’ interview skills, workshopping their writing, practicing photography, and setting up interviews for the coming year’s magazine issues. Mixed in with all of that goodness, the students are now involved in a museum project Foxfire is developing with local herbalist Patricia Howell as well as childhood nutrition coordinator Megan Connolly and teaching kitchen coordinator Cara Lee Langston, both from the Food Bank of Northeast Georgia. We’re creating an apothecary. Building on Rabun County’s rich biodiversity and abundance of native edible and medicinal plants, and drawing on the great stores knowledge in the archive, we are working to transform the Phillips Cabin into a workable apothecary and a space for classes and workshops on wild plant foods and herbal medicines. 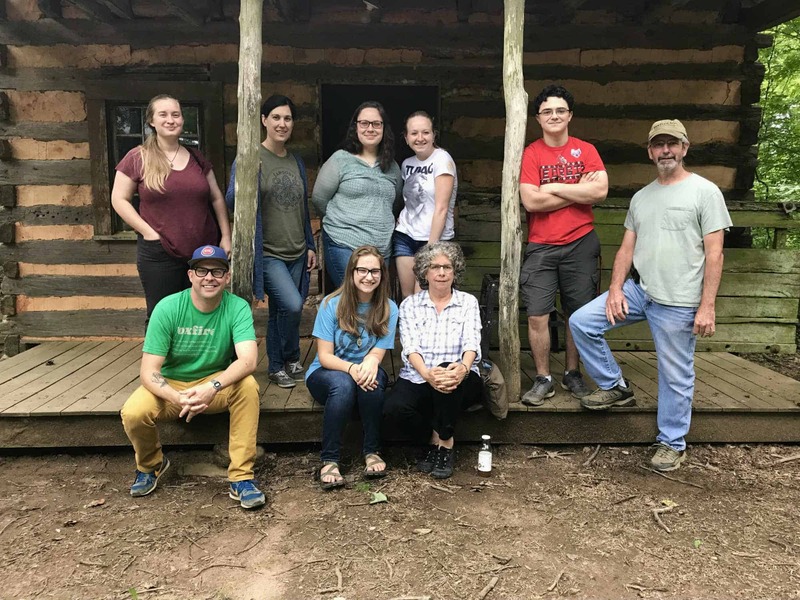 Members of the “Apothecary Team” (standing, L-R) Eleanor Boggs, Cara Lee Langston, Carlie Owens, Reagan Turner, Jesse Barlow, and Barry Stiles, (seated, L-R) T.J. Smith, Susanna Grafton, and Patricia Howell. As part of this larger project, the students worked in the Foxfire garden with Megan, planting some native medicinal plants, including goldenseal, Solomon’s seal, and wild ginger. This planting is the first of many to come, as we plan to also develop a space next to the new apothecary for cultivating other native medicinals. Then, on Thursday, the students and staff met with Patricia and Cara Lee at the Phillips Cabin to assess the situation there. This past winter, curator Barry Stiles and our resident handyman (and retired US Forest Service ranger) Dave “Dexter” Jensen worked to clean out a number of the cabins that are not currently curated, including the Phillips Cabin. Thanks to that work, we were able to get a good sense of how this space will work for our apothecary project. Today, we got started with a little apothecary-related work as Ellen and Barry identified some unused bottles and jars at the Moore House that fit some our needs for the project. 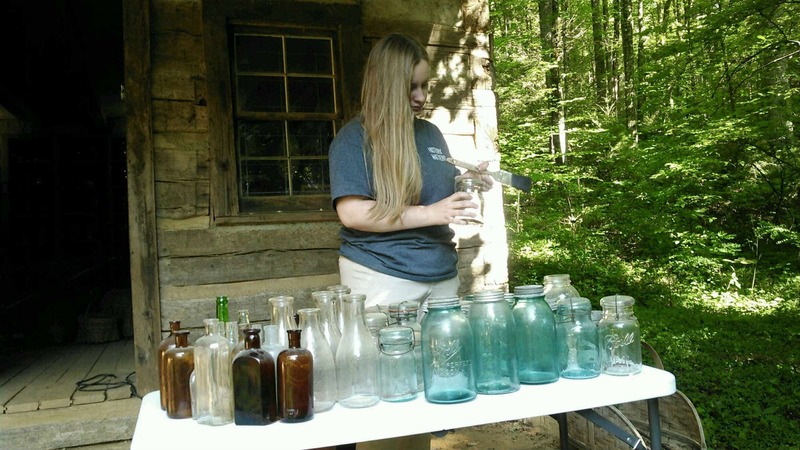 Virginia Tech intern Ellen Boggs cleans up some of the jars for the apothecary. Yet, even as cool and interesting and fun as all of that sounds, the events of this morning may just be the highlight of the week. It all started with a phone call from Neal James. 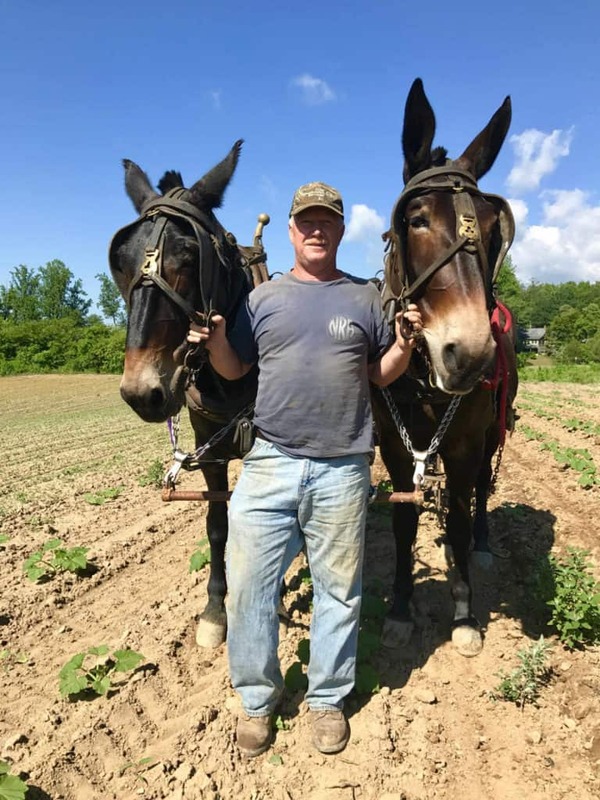 I had been talking with Neal this week about the prospect of having some of the students come out and interview him at one of his fields while he cultivated with his percheron mules. The weather would not cooperate. Even though we didn’t see much rain up at The Land this week, Kelly’s Creek kept getting just enough showers to keep Neal and his mules out of the field. That is, until this morning. Neal James with his percheron mules, Maggie and Mandy (aka, M&M). Thanks to some drier weather yesterday and last night, Neal’s fields out in Dillard were ready for cultivation. So, he and Maggie and Mandy, his matched pair of percheron mules, were getting after it first thing this morning. Reagan, Kaye, and I were able to get out there around 9:30 this morning to document some of the work and give Reagan an opportunity to make arrangements with Neal to sit down for a longer interview in the near future. We got some great pictures and some video of Neal and M&M working the rows of young yellow squash. This is just the beginning of a longer process of creating a Foxfire article. These are the sparks that ignite every article – a call, a chat, a handshake. You will get to read and see more of Neal as the students develop the longer article and, perhaps, hear a podcast or watch a video about Neal and the girls. It was good to visit with Neal (whom I first met when I was working with farmers through the food bank) and his mules. It was a good way to start the morning. Then, the still arrived. The moonshine still donated to Foxfire by the United States Forest Service. Yes, never underestimate the importance of networking. In our case, the networker in question is Dave and his network includes a lot of good folks at the US Forest Service. 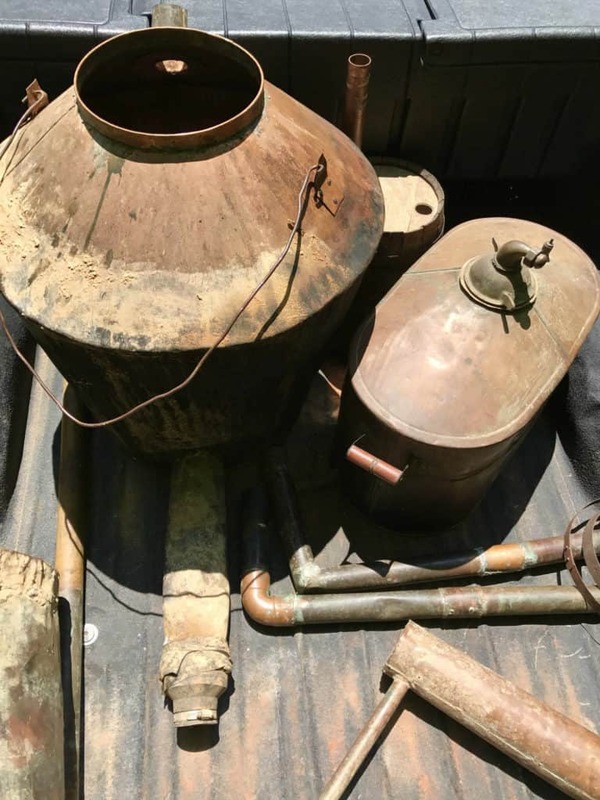 Through his connections, we were able to procure a moonshine still that was “collected” by the USFS some time ago right here in Rabun County. It is quite a sight to behold. Upon closer examination, we even spotted a few bullet holes perhaps put there by a rival moonshiner to cut out the competition. It is a near-perfect specimen and is going to add a great deal to our collection. With any luck, we may get it up and running again as a demonstration piece for a future event (stay tuned). Yes, it has been quite a week. It’s the kind of week I’ve dreamt about since I started back in January. This level of activity and progress at the museum feels good – stirs the spirt. At the beginning of the week, Kaye and I talked with the students about the legacy they inherit when they join Foxfire. We reminded them of all the work that has come before them. We taught them about the roots of the organization and showed them the dreams of those first students. Finally, we challenged them to assume that same level of ownership. Those first students built a small empire of magazines and books that they wrote. They erected cabins, produced music albums, and hosted radio shows. They sought the stars and found them. What will this newest generation accomplish? I can’t say for certain, but I can tell you the potential is there to achieve as much if not more. T.J., I am so happy and excited about all you have accomplished with the staff, Kaye, volunteers, and the students in such a short time as director! It’s so wonderful to see our planned projects come to creation and to see all the new ones that you’ve planned being implemented! Thanks to all of you, especially Kaye and the students, who are carrying forward the legacy that she and her classmates left to them. The continued documenting of our heritage and culture is so important for generations to come. My Concept Plan for the Museum was to see it come to life, and I am so thrilled to see that happening!! I can’t wait to see what you all accomplish and to come visit, if well enough by then, the living history museum. Blessings to you all. TJ – I totally agree with Ann’s comments. Her vision of continuing to document local heritage and culture coincides exactly with mine. Your journal entries are inspiring….plowing with mules, restoring an authentic still, using local plants to re-create an old apothecary…. Lucky students who get to experience this fist hand. And exposing the general public to this through the upcoming Heritage Days events…. All of this is what Foxfire is all about. Like Ann, I am thrilled. For a fan of Foxfire located as far away as I am in Massachusetts, reading this journal entry almost makes me feel as though I were there walking the trails and soaking up the Southern Appalachian history and culture Foxfire preserves. Your plans to set up an apothecary using native medicinal plants are wonderful! Although we tend to think of the Southern Appalachian hill dwellers as socially and economically isolated from the larger society, trade in medicinal extracts connected these communities to other parts of the country and even foreign lands. Just one of the many dimensions of the rich heritage Foxfire brings to life for the present-day visitor! I grew up on War Woman with my Great Granny she would make all the medicine, salves, tinctures for folks in our family I learned from her and have my own Apothecary here in Franklin Co Ga. using the same old recipes she did.